April started out with a little optimism as reporting from March hinted at some possible momentum, then the Empire State Manufacturing Survey kicked off the Fed district reporting at mid-month with solid positives, but it all went South in a hurry. The BWEI® tied its lowest reading of -.39 since we started making the index available publicly in August of 2014. Of the 8 major categories, 3 managed readings above 0 including Consumer Measures, which slipped a substantial .5 from .8 to .3. Real Estate and Services join Consumer on the plus side of zero, and both showed fractional improvements over March. Employment, General Measures, Inflation, Manufacturing and Retail remain in decidedly negative terrain. We don’t see the Fed making any big moves based on this data, which should make the markets happy but signal defense to those who manage real businesses and employ real people. 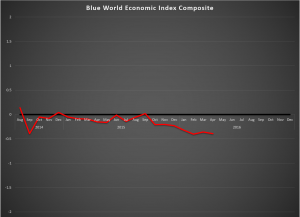 Look for The Blue World Jobs Report Analysis next Friday and have a great week. Mixed again but leaning cautionary for March of 2016. Let’s start with the positives. 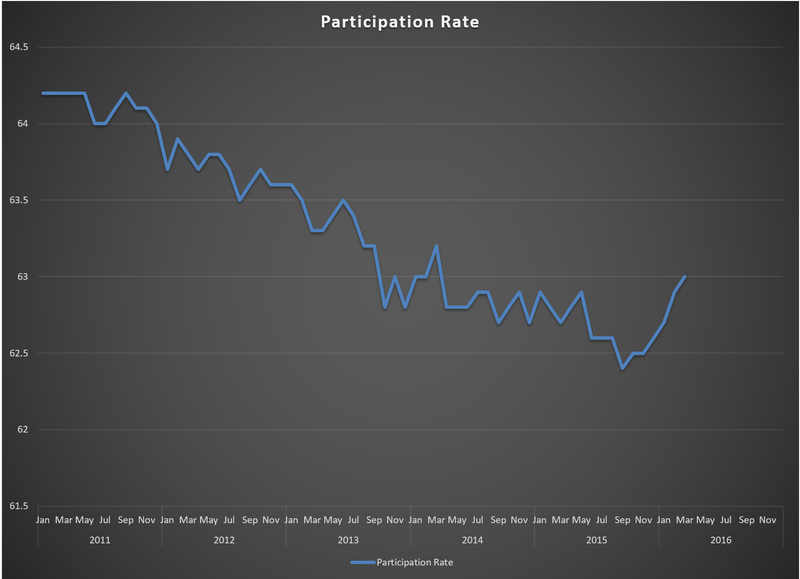 The Labor Force and Participation Rate increased, the Not in Labor Force total decreased and pay recovered from last month’s backtrack. 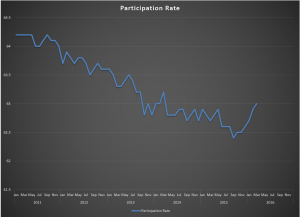 We don’t need to keep explaining the phenomena that makes the Unemployment Rate irrelevant, but we can’t help but point out the 0.1 percent rise to 5% is actually an indication of some strength due to the upward trending Participation Rate. On the downside the Work Week remained flat for the non-farm population but pulled back in both construction and manufacturing, whose diffusion index has lost 20 points in the first quarter falling to 37.3. That’s really bad. The real concern, however, is hiding behind the headline of 215k net jobs. Revisions to the first two months of the quarter so far netted a largely insignificant -1k. The problem is in the private vs. public sectors. March saw a net 20k in government hires, leaving the private sector picking up only 195k. The average for 2015 was net 222k hires per month in the private sector. Q1 of 2016 is sporting an average of only 195k. This report typically issues on the first Friday of the month. They will often delay for a week when the first Friday also happens to be the first of the month but not this time. Not only is it the first of the month, but it is also quarter end. Respondents, especially businesses, have higher priority internal undertakings than the timely reply to surveys. That leads us to look for potentially larger revisions to March 2016 over the next couple of months as more complete data makes its way home. What about the Fed? There is ammunition here for the Doves and Hawks. You can spin this one for strength or weakness, hence our actionable management intelligence characterization of “mixed.” Ultimately there is not enough here for a rate hike, and watching the Fed’s Labor Market Conditions Index on Monday will be important, although we don’t expect any huge move in either direction. That said, we see the Fed holding pat. Apparently, so does Ms. Yellen following her dovish leanings yesterday. 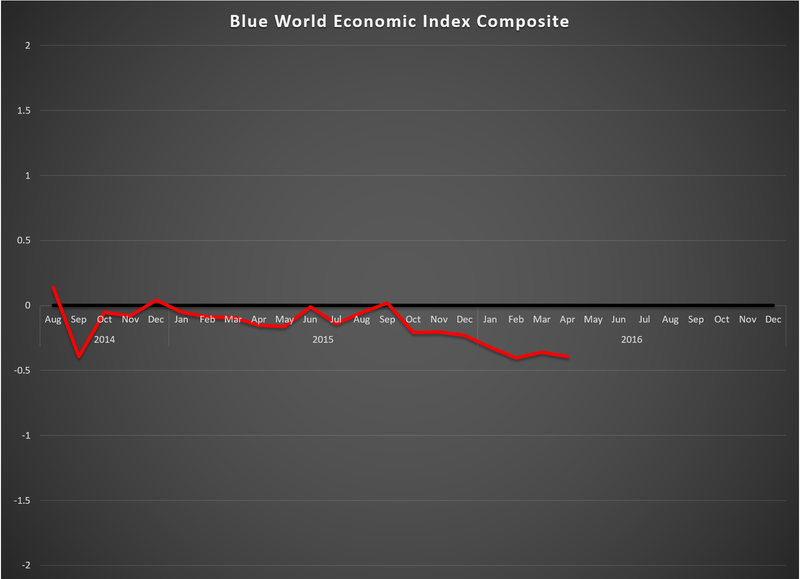 The Blue World Economic Index™ for March 2016 supports the doves.